After a wonderful meal and plenty of good conversation, I thought we were going to see a light display. Turns out it opens tomorrow, not today. So I checked to see if there were any videos around to watch. There was Michael Moore’s Sicko . I’ve wanted to see it for a while; in an odd way, Thanksgiving day was probably a good choice. Sicko, you probably remember, came out in 2007. It probably had a lot to do with the outpouring of support for health care reform in the last presidential election. It’s hard to remember now, but the Republican Party Platform had health care reform provisions that included ending exclusions for pre-existing conditions. Campaigns of all stripes had dueling medical horror stories; there was not a candidate for major office who was not promoting the need for health care reform. Where did all that grass-roots fervor go? Sicko provides some interesting contrasts,in interviews with Canadians, Brits, and French who are all non-plussed at the workings of a health care system where something things are covered and others not, or some people get coverage and others do not. One extended interview draws out the notion of a society that realizes it’s in the best interests of all for each to care for the other. The French mention solidarité, a basic principle of their governance: responsibility for each other’s welfare. Sicko certainly reveals the worst of the U.S. health care system: patients denied treatment for serious illness for trivial and unrelated pre-existing conditions. Patients dumped on the street in front of homeless shelters still wearing the hospital gown from the emergency department. The work of medical advisers whose pay is based on the number and size of claims they can deny. The heartbreaking stories of patients or family members who beg and plead for coverage with all the powers that be, to no avail, were perhaps the hardest to watch. The most chilling moment was the testimony of a physician who had won promotion as a medical reviewer through her denial of a life-and-death treatment to a patient. Chilling not because she did it – the movie already provided ample evidence for that line of work. But she was absolutely safe to offer this testimony to the U.S. Senate Hearings because her action does not constitute homicide under criminal law nor anything that would cause her license to be revoked under civil law. Her line: “We are not denying treatment, we are refusing payment,” reveals the bizarre thought in the medical industry. If denying payment for an expensive treatment is not the de facto denial of the treatment, what would be? Sicko is not perfect – the trip to Cuba is a bit too contrived, the focus on the horrendous failures of the U.S. system denies the many inventions and advances in medical care that we’ve created. Beyond the life-and-death cases are those in which health care payments send people into bankruptcy, are the stress that breaks down marriages and breaks up families, or makes drive people into chronic poverty. Throughout Sicko, Moore claims that Americans don’t stand together for basic social goods like health care in part because of fear – fear of losing the job or the coverage they already have, or of paying even more for health care. He points to those who monger fears about health care, especially lobbyists and some ideological commentators. Long before the tea-parties and the bullying at town hall meetings, he noted that attempts to provide health care are ultimately de-railed by the companies that are making huge profits from them. How many thousands of jobs would be lost if there were not hundreds or thousands of different insurance plans, if every procedure and treatment did not have to be scrutinized, reviewed and authorized? Entire insurance firms would probably go out of business in rapid order. I have to believe that some of the hue and cry is simply self-protection by those whose business is to turn the provision of health care into an obstacle course. 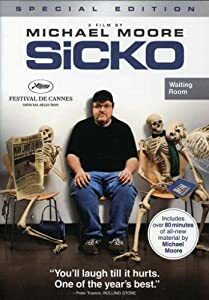 If you haven’t watched Sicko lately, it’s worth seeing it again.